The state’s centers for independent living, already reeling from deep cuts, appealed Tuesday for legislators to reject a proposal to eliminate all state funding for their facilities. The five centers, first established under state law in 1988, provide a wide array of training, counseling and referral services to thousands of residents with physical and mental disabilities, the elderly and the poor. Leaders of the centers, who already have watched state funding shrink by 62 percent over the past year and are at risk of losing the rest this spring, also said their ability to serve most sections of Connecticut already has shrunk dramatically. And if proposed cuts in federal funding come to pass, some centers are at risk of closing entirely. 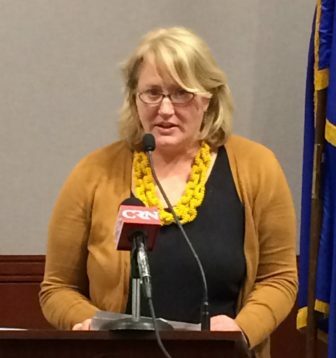 “If state budget cuts are implemented, in this new era of less support from the federal government, the individuals we serve could have nowhere to turn for support,” said Daria Smith, executive director of the Connecticut State Independent Living Council. “We’re the one place that doesn’t say ‘no’ to people, that doesn’t say ‘you’re not eligible,’” said Eileen Healy, president of the Connecticut Association of Centers for Independent Living. 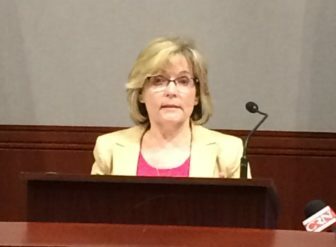 The centers, based in Hartford, Naugatuck, Norwich, Stratford and West Haven, had served clients in all 169 towns until legislators and Gov. Dannel P. Malloy reduced their state assistance this fiscal year from $529,000 to $202,005. Now the governor has proposed eliminating the rest to help close a $1.7 billion projected deficit in next fiscal year’s finances. That first reduction translated into staffing and programmatic cuts, and particularly reduced outreach efforts to serve clients that live several towns away from the nearest center, Healy said. The centers now run programs in 25 communities. “Now we have to tell people, ‘If you can get to us, we can try to do what we can,’” she said. The centers provide a wide array of training and guidance services, helping the disabled and others secure jobs, return to school, find housing or transition from nursing homes to independent living. They also link many clients with various medical and social support services. 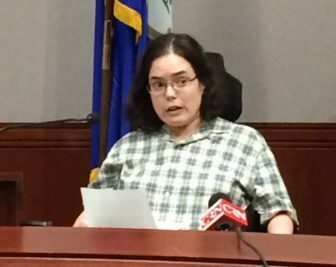 Jade Vail of Manchester, a former client who now works at the centers assisting others, said she overcame various disabilities, being in a wheelchair, and a period of homelessness. “I learned people with disabilities can have a piece of the American Dream,” she said. Healy also said that the centers are a cost-efficient operation. Helping the disabled and the needy to be self-sufficient, or to avoid institutional care, saves far more than the centers’ combined annual budgets. For example, helping 233 nursing home clients move out of those facilities and into communities last fiscal year helped save state government $10.3 million, she said. State assistance currently represents about 45 percent of the funding centers receive annually, Healy said, adding that federal grants make up the rest. But with proposals to cut federal aid pending on Capitol Hill, a combination of state and federal funding reductions could mean more than further reductions in numbers of clients served.